Well, a public holiday means long weekend, and now my new job has been settled and my movement to new home is done, so which also means I'M BACK IN BUSINESS, BABY!!! 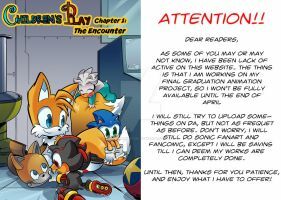 Wow, it's been a while since I have posted up the first page of "Children's Play", I have read your comment of when's my next page or chapter for my other Sonic fan comics every day, and although I wanted to speed up my progress, I have my own life to take care of, but I do promise that I will TRY to follow up these fan comic as frequent as I could. Now, enjoy this page and perhaps next time I will post up the next chapter of "Tale of Origin", which is ONLY TWO MORE CHAPTERS TO GO! Text edited by my Ghost Writer. Uncle Chuck!!! I remember him from Underground, and the one with Knot-hole! Sheesh, we sure Sonics mama is a Hedgehog and not a Bear in a costume? Hey! 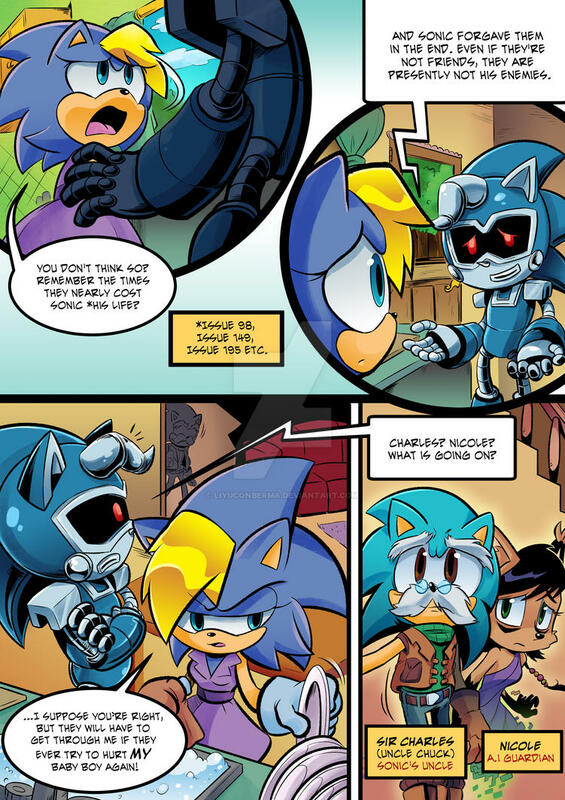 Shadow helped Sonic in Issue 195! Yandere!Bernadette much? jkjk Her face looks yandere to me in that panel..the motherly kind of being yandere..
omg you upload THANK YOU so much for uploading. I'm curious, does this take place before or after the reset in the comics? LOL! From what she shared with me, this is based on the original world as if the Genesis Wave never happened. And it will never happen in this continuity. To be honest, I always preferred the Pre-Genesis, so can't blame the artist. I think most people feel that way. Archie has never really recovered from the fiasco. I always prefered Nicole, Sally and Bunny without gloves. I don't know why. They always looked better before the reboot. Now...they look and act pathetic. Watch out! Bernie's on the defensive. Chuck & Nicole look amazing! Sonic's mom calling him her baby boy is too precious for words. You are not going to let this go, are you? Maybe. I wonder how sonic's parents are going to do. What were the reactions of Sonic Shadow and Silver when were first introduced to Benonic? ! NN..NOT THE TEEN THE LITTLE KIDS! That will be in Teen's Play Issue 2, this is Children's Play Issue 1. I'm just doing one issue at a time. Oh boy........ *^* it's going to be more EXCITING what I thought !!!!!! Due to following this comic, I know what will happen next and yet at the same time I don't know how the Hedgehogs will react. Yess you continued!! Really love this comic and you're doing a very awesome job! !